In today’s post I’m going to focus on propagating plants from stem cuttings. I’ve been growing plants from cuttings for a few years now and have learned you don’t need magic powers, rather a little bit of knowledge and a lot of patience … oh and a little bit of luck. 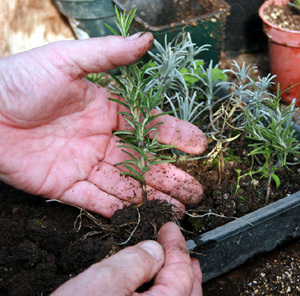 Raising your own plants from cuttings is a simple way of growing new plants in the exact image of the parent plant. If you haven’t tried it before then I urge you to have a go! It’s great fun and a really great way to produce loads of plants for your garden, and all for FREE! At Blackbirds we’re growing a range of softwood and hardwood cuttings for our new Back Garden Nursery, most of which we hope will come from stock plants. We use a number of techniques including cuttings, division, from seed and layering which I’ll write about over the coming weeks and months. If you’re considering growing your own plants from cuttings you should read this first! If you’re thinking of growing plants from cuttings then you need to research something called Plant Breeders Rights. Basically it’s a law that was introduced to protect the rights of plant breeders … a sort of patent for plants if you like. Essentially it made it illegal to propagate certain plants for profit … but the good news is there are loads of varieties that were around before Plant Breeders Rights were introduced that you can propagate. 1. Always read the label on any plant that you buy. It will clearly state if the plant is subject to Plant Breeders Rights. 2. 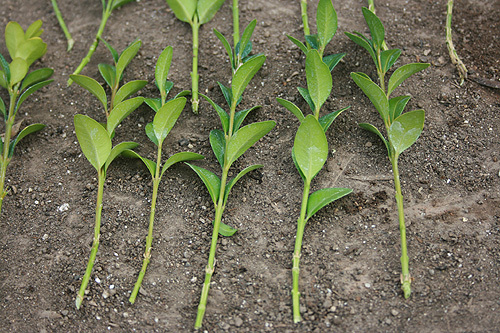 Look for the older varieties and you should have no problems with propagating them. 3. Propagate these older varieties so other growers can access these unprotected varieties. The more ‘protected plants’ that are introduced to the market the more demand there will be for the unprotected varieties. I can’t claim to have discovered anything new here, as the methods I use have been used by gardeners for years, but I’ve developed a system that works for me, which I’d like to share with you. Tend to be taken from new growth, typically cut from the Spring onwards, sometimes known as tender cuttings. They tend to root faster than hardwood but are prone to wilt and die if you don’t adhere to a few basic principles that I’ll run through in a moment. Taken towards the end of the current growing season, ideally taken from the current seasons growth. 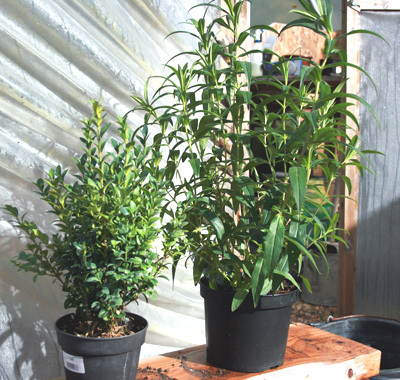 You can propagate both evergreen and deciduous plants from semi hardwood cuttings. The only snag with deciduous is you can’t tell if they’ve developed roots until they sprout new leaves the following Spring. Taken at any time during the growing season using stems grown in the last 2 years. Anything older will struggle to root and the resulting plant won’t grow away as well as the semi hardwood version. When you’re looking for plants to use as cutting material try to select healthy, strong looking plants with plenty of new growth. It’s the new growth that makes the best cutting material. If this is your first attempt at growing cuttings Buxus (Box) is a great plant to start with, as they nearly always root and they can make great little hedges for your kitchen garden! I paid £3.75 for this Buxus and £4.80 for the Penstemon, which I thought was a pretty good deal, considering I should get 5 and 10 new plants from each plant. Although it’s not critical I’d recommend using rooting compound to encourage the cutting to develop roots. I tend to use an organic liquid compound, for no reason other than it’s nearly always works for me. Also you’ll need a plant pot or a seed tray filled with a mix of 50 / 50 potting compost and vermiculite, or sharp sand. As I plan to raise several hundred plants for our Back Garden Nursery at Blackbirds I’m going use mostly sharp sand as there is a plentiful supply at the local builders merchant, and it works out a lot cheaper. This part is REALLY IMPORTANT as it will increase your chances of success ten fold! I nearly always collect my cutting material early in the morning when the plant is bursting with energy. Not an exact science I know but it does seem to make a difference. I make sure I have everything lined up ready to go as there’s nothing worse than having to stop half way through while I try to find something. I also try to get the cuttings into the compost as soon as possible after it has been cut from the plant as it will continue to transpire moisture through the leaves and start to wilt, as it has no source of moisture. Although it’s not critical I find it helps if you ‘tear’ semi hardwood cuttings from the stem of the plant leaving the cutting with a slight ‘heal’. I don’t know why, but it just seems improve your chances of success. You’re going to need about 4-6 inches of stem above the heal, so snip off the rest of the cutting with a sharp knife. Penstemon’s will nearly always root with a small heal, or alternatively you can make a straight cut across the stem, just below a leaf node. For regular softwood cuttings like Geraniums and Coleus I make a clean cut below a leaf node, strip most of the leaves away and plant in either sharp sand or a 50/50 compost/vermiculite mix. You can use seed trays, plastic pots, clay plots, or a purpose built cutting table for your cuttings, but remember, they hate sitting in wet compost, so ensure you have ample vermiculite or sharp sand in your compost mix. Plunge the cutting into the rooting compound, dib a small hole with a pencil or a small dibber, and firm your cutting gently into the compost mix. Water the cuttings in and leave them on a windowsill, or a greenhouse. 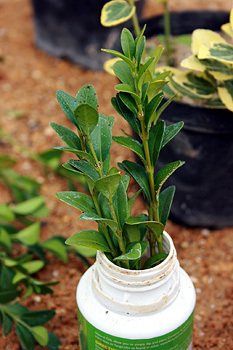 It will help the cuttings if you can keep them away from direct sunlight for a while or they will be inclined to wilt. Don’t worry if they do as most cuttings wilt immediately after planting. Just give them a light spray with water and they should perk up in no time. On average softwood cuttings take around 3-4 weeks to root, but this is dependent to a large extent on the growing temperature. These are some Rosemary cuttings that I took just over 3 weeks ago and already you can see they have developed a good root system. The next stage is to plant them up into individual 3″pots. I like to use clay pots for my herbs as they really don’t like moisture and the clay will soak up any surplus water. You can treat your semi hardwood cuttings in exactly the same way as your softwood cuttings and they will root, but I like to use a trench. I dig a trench about a spades depth in a sheltered part of the garden and line the bottom with sharp sand. 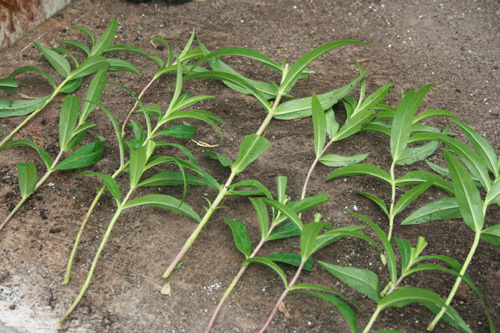 Then I select a decent sized stem from the plant and cut several cuttings approximately 5-6 inches long. Not really sure if it makes that much difference but I also damage the base of the cutting slightly by scraping the bark away with a knife. 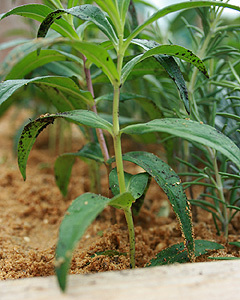 It’s been proven that a plant will try to repair any damage by growing a callous over the wound and then send out roots. I can’t prove it either way, but it does seem to work. Then I lay the cuttings upright in a row at the bottom of the trench and back fill with soil. Water them well in and pretty much forget about them until the following Spring. If you’ve been successful you should start to see signs of new life on the stems around the end of March, middle of April. I’ll be looking at our first batch of cuttings and planting some of them up ready for growing on. I’ll also be running over the plans for our Back Garden Nursery and starting work on clearing the plot. If you’d like to leave a comment, please do so. In today’s post I want to focus on propagating with cuttings. I am waiting patiently to take hard wood cuttings – oh for leaf drop. Loads of good info here. 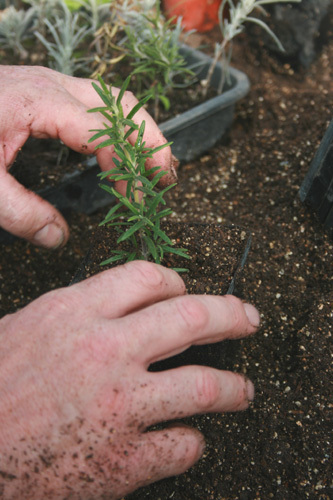 How long does it take your Buxus sempervirens cuttings to root? I have had some success in striking cuttings of Buxus sempervirens ‘Blauer Heinz’, but it has taken 90 days for roots to begin to form. I take my box cuttings in October and plant in a sharp sand mix. I’m not absolutely sure how long they take to root, but I check them the following March and they have a healthy root system. I’ll check them at the weekend and post a note on how they’re progressing. Please can you give more information about the misting system you use with your sharp sand cuttings bed?